Political rhetoric generally, and conservative rhetoric more specifically frequently makes reference to “working Americans,” a sort of code word that distinguishes them from the putatively unworthy souls unable to work or otherwise reliant on government’s assistance. Much of conservatism’s political bread and butter for many decades has been the rhetorical highlighting of this distinction, claiming industriousness as a basic conservative principle The irony, and the inevitable hypocrisy is that in both belief and action conservative ideologues and Republican politicians have scant regard for the inherent dignity of work. The prevailing ideologies subsumed and blended under the rubric conservative ideology: Ayn Rand’s Objectivism, the Austrian School, Supply-side (Trickle-down) and Libertarianism do not simply laud success, and do not simply hold up those who derive handsome incomes from making decisions about the investment and uses of the capital in their possession, or those who own businesses or manage corporations as models, they in fact elevate them to a superior class of human being, into a de-facto nobility, with all the rest, the worker bees not simply less privileged, but a secondary class of citizens, as well as human being. Look closely at these ideologies dominant on the right and in the Republican Party, and their value system when it comes to how people make a living and how much they earn, and what you find will go a long way toward explaining conservative derision toward the American social safety net, toward organized labor, toward workplace safety and other workplace regulations, toward a progressive income tax, as well as conservative indifference to wage stagnation and wealth disparity, and the relentless tax code protection and outright coddling of the wealthiest Americans, even when middle class government initiatives are imperiled, or tax burdens for the middle class are disproportionate. This elevation of one select group of Americans over the rest is placed in stark relief, and is mightily informative when attempting to understand the behavior of Republican ideologues. For these ideologues there is a genuine distinction between working hard in order to attain wealth, and hard work, whatever the pay. The first is laudable, the second an inferior choice of lifestyle. This illuminates the right’s insistence that health care, for instance, is not a right but a privilege, and similar insistence that no basic, minimal standard of life should be a goal in affluent, modern societies, but rather that everything has its price, and only by affording that price does one obtain anything, even the barest necessities. Even if one puts aside Republicans’ political behavior and their ideological influences and operative philosophies, their own words offer enough anecdotal evidence simply by themselves. In rebuffing the hardships of working Americans or elderly Americans, or the problem, for instance, of widespread lack of accessibility to affordable health care how often have we heard it said that if these individuals had worked harder or were working harder, had obtained more education, or more successfully advanced in their working lives they would be able to obtain all that they require. Clearly, hard, honest work is not enough in and of itself, and should derive no material minimum standard of life as a reward for the virtue of the work itself. The value is placed on advancement, on income, on acquisition, not on work itself. Hard work in and of itself garners no elevation in respect nor even basic respect according to this philosophy. This ideology has a terrible blindness to values other than those that are purely acquisitive. Teachers who find reward in teaching, whatever the remuneration, or at the least, with a full recognition of the lifetime income limitations; social workers who find gratification helping others with daily struggles; or nurses or cops, who feel they are providing an essential social function even if the financial reward is understood to be relatively modest their entire lives; government workers upon whose duties countless if not all citizens depend upon on a regular basis, all have diminished value according to this philosophy. Certainly the contributions made to the quality of life, the intellectual richness, beauty or consolation produced by artists is beside the point in this fully materialist value system. This harsh assessment of labor and the value of work conveniently dismisses that society depends upon this array of work done by those of modest means. If anything, the higher up in the income scale one is the more demanding of efficiency from those who clean, serve food, do repairs, cook, teach, transport or made goods on a factory floor. When it comes to basic benefits and necessities these workers may hope to attain, they are dismissed for their failure of advancement, for their contentment or complacence with their work and incomes, though of course were they all to advance, no one would be left to do the many jobs everyone, including these ideologues, depend upon and expect to be in place to serve them, and to meet their needs. The class element of this philosophy is glaringly on display when the subject is organized labor. Proponents of conservative philosophy have always appeared utterly galled by the access to a middle class life afforded to industrial workers able to organize themselves, and to thereby claim greater benefits from the value produced by their own labors (home ownership, retirement security, health care, higher education for their children). 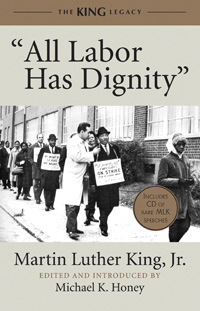 Here again is a transparent valuation and stratification of labor: those who have capital or ownership rights are entitled to every sort of privilege or material comfort, those who do the actual work should be fortunate simply to be employed, settle for what is offered, and accept the meager or replaceable value of the work they do. Hard work and good work have no inherent value at all, and certainly retain no inherent dignity in this ideological point of view. Alternately, what that is actually positive or what that can rightly be called a contribution to society at large by hedge fund managers, securities traders or corporate management is never questioned, it is just assumed. There is no relationship here to the value of the work done, only the amount of income it generates, which in reality is the only true value in this philosophy: the level of income, and the amount of assets. Inheritance is fine. Work is beside the point. Understanding this view of work and workers always offers one valuable insight into the disregard of, and lack of interest on the right in the decades of wage stagnation, and the loss of ground for the middle class. It illuminates why the actuality that the economic rewards of annual economic growth flow only to the highest income brackets rather than more evenly to all those who indeed produced the economic growth and economic expansion, is of utter unimportance. It makes perfectly clear why the wealthy are lauded with the classification “job creators” and all but deified, while workers themselves are regarded as nothing but dependent cogs owning all to the wisdom and munificence of those sitting atop the perch. When Republicans obtain working class votes, and they do have a dependable number of such voters who vote outside of their own economic interest on a regular basis, knowingly or unknowingly, it is almost exclusively through the cultivation of cultural resentment (Limbaugh and the like are just perpetual wave machines of resentment) resentment for the educated, the supposedly secular left, the purported handing of hard earned tax money by liberals to lazy people, the equating of calls for fairness with entitlement, an entire system of rhetoric and clichés, false generalities and utter falsehoods that solidify in the minds of those who hear them repeated virtually every second. Along with this indoctrination is a heavy gloss of falsification of American history, and a great dollop of ginned up anxiety over change, in particular change of the ethnic and demographic variety. It is a pity, truly.